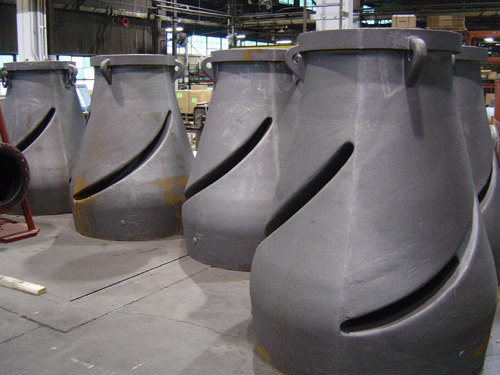 At Glidewell Specialties Foundry Co., we take pride in our 5 decade tradition of providing high precision casting services. At our jobbing foundry and job-shop, we provide flask and flaskless no-bake sand casting, utilizing MAGMASoft Software for solidification analysis. 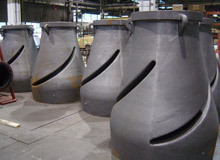 We cast all grades of ductile and grey iron to create components of a variety of sizes, including widths up to 180", lengths up to 474", and weights up to 28,000 lbs. Our vast array of equipment includes two 12,000 pound coreless induction furnaces, five sand mixers, 19 element chemical spectrometer, a carbon and sulfur determinator, among other advanced casting machinery. We also offer a wide range of non-destructive testing (NDT) from our facility, including die penetrant and ultrasonic testing, as well as magnetic particle inspection. Our ISO 9001:2008 certified facility guarantees the utmost quality of our products, meeting many high industry standards as set by the ASME and ASTM. To learn more about our precision casting services, please see the following table or feel free to contact us directly.